Half Moon Bay recently celebrated their 41st annual pumpkin weigh-off, and the usual participants were on hand: autumn scenery, fall-themed decorations, plenty of pumpkins and – of course – forklifts. According to the SF Gate story, an enormous white pumpkin took top honors with a weight of 2,058 pounds. You read that correctly. That’s over 2 tons of gargantuan gourd. The pumpkin’s weigh-in process generated plenty of excitement. 30 pumpkins in all were scaled for the event, which took place in a parking lot adjacent to Main Street. And when it was all said and done, John Hawkley of Napa, CA, won the weigh-in with his 2-ton plus pumpkin. The award for this year’s prize was $13,348 check — that’s almost $6.50 per pound, if you’re keeping track. It was Hawkley’s second straight winning pumpkin. To move the huge pumpkins around the site, heavy-duty forklifts played a big role in this year’s Half Moon Bay pumpkinfest. In the early 1970s, forklifts weren’t required. In fact, the winning pumpkin of the first pumpkin weigh-in was just 132 pounds! Pumpkins can grow noticeably in just 24 hours. 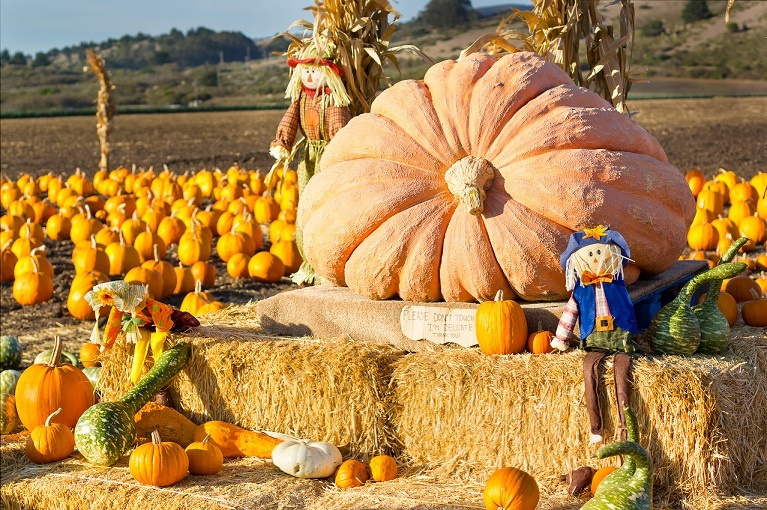 Some gourds in Central California’s ideal climate can gain 50 pounds in just one day. The five heaviest pumpkins were auctioned off to the highest bidders. Whether you’re hauling 1,000 pound pumpkins or warehouse boxes, forklift safety is always critical to doing the job right. CertifyMe.net, your #1 provider of online forklift training, delivers the best instruction on the internet and elsewhere. With a 100% pass rate and nuggets of OSHA information throughout, CM training is the best option to get your workers up to speed as quickly and efficiently as possible. Get started today – speak with the authority on OSHA forklift training at (888) 699-4800, or visit the Certify Me contact page. Thanks for checking out our blog. And have a fun & safe Halloween – no matter how big your pumpkins get!